Mouse Speeder is an open-source piece of software that allows you to change the sensitivity of your mouse by pressing a user-defined key. Not all mice provide DPI switches, and for this reason Mouse Speeder was developed. Once you run Mouse Speeder, the current mouse sensitivity is displayed on the left area of the main window. To set a new value, you can use the dedicated slider. When selecting your hotkey, you can choose almost any keyboard key with some exceptions such as Ctrl, Shift, and Alt modifier keys. After you select your key, check the box next to the “Enable hotkey” option. 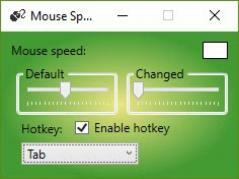 After you set it up, you can minimize Mouse Speeder and the hotkey will remain usable.